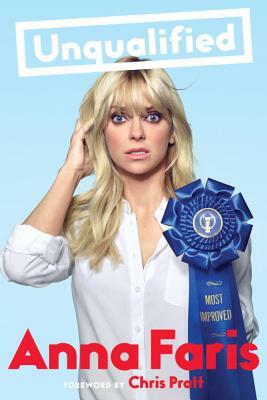 A hilarious, honest memoir—combined with just the right amount of relationship advice—from the popular actress and host of the hit podcast Anna Faris is Unqualified. Anna Faris has advice for you. And it's great advice, because she's been through it all, and she wants to tell you what she's learned. After surviving an awkward childhood (when she bribed the fastest boy in the third grade with ice cream), navigating dating and marriage in Hollywood, and building a podcast around romantic advice, Anna has plenty of lessons to share: Advocate for yourself. Know that there are wonderful people out there and that a great relationship is possible. And, finally, don't date magicians. Her comic memoir, Unqualified, shares Anna's candid, sympathetic, and entertaining stories of love lost and won. Part memoir—including stories about being “the short girl” in elementary school, finding and keeping female friends, and dealing with the pressures of the entertainment industry and parenthood—part humorous, unflinching advice from her hit podcast, Anna Faris Is Unqualified, the book will reveal Anna's unique take on how to master the bizarre, chaotic, and ultimately rewarding world of love. Hilarious, honest, and useful, Unqualified is the book Anna's fans have been waiting for. Anna Faris is an actress, producer, and top-rated podcaster. Her podcast, Anna Faris Is Unqualified, averages 4 million downloads a month. Faris currently stars on the CBS hit comedy Mom and has had memorable roles on Entourage and Friends. She most recently starred in MGM/Pantelion Films' remake of Overboard alongside Eugenio Derbez. Faris produced and starred in The House Bunny and What's Your Number and her additional films include the Scary Movie franchise, Lost in Translation, The Dictator, Observe and Report, Brokeback Mountain, Just Friends, Smiley Face, Keanu, and the Cloudy With a Chance of Meatballs franchise. A native of Washington State, she lives in Los Angeles with her family.